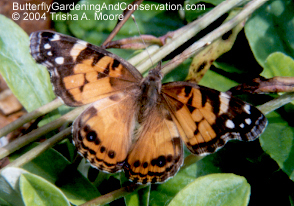 The range of the American Lady extends through most of the continental U.S., with the exception of Montana, Idaho and part of Washington. It is also common in Mexico and occasionally strays to Hawaii and part of Europe. Host plants preferences are from the genera Gnaphalium, Antennaria and Anaphalis. In my area of the midwest Gnaphalium obtusifolium, Antennaria plantaginifolia and Anaphalis margaritacea are all used as hosts. 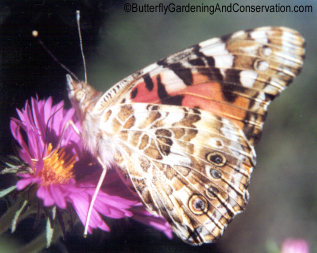 Adults feed on flower nectar, but may visit rotting fruit or tree sap on occasion. 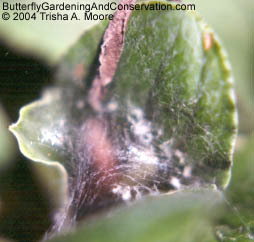 Eggs are pale green and laid on top of the leaves or on the underside. 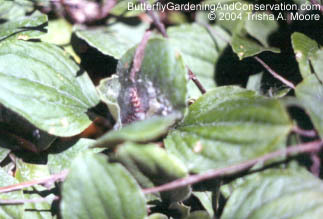 The caterpillars make nests in the leaves. 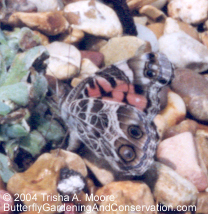 Summer 2004 was the first time I saw an American Lady in my garden. I was able to see it flying around the host plants from a window. When I went outside to see if it really was an American Lady - I was very pleasantly surprised! I watched it for a while as it laid eggs on the plants. 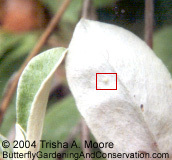 American Lady egg on top of host plant leaf. 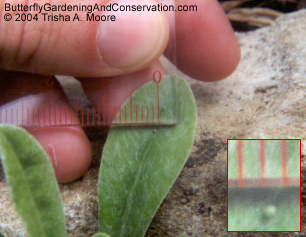 As you can see the egg is very tiny, less then a millimeter in diameter. If I hadn't seen the female laying the eggs I never would have found them. 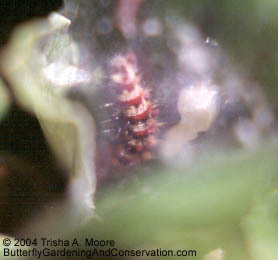 Late instar caterpillar. I had to pull apart the leaves that it had made the nest out of to be able to see it. I left these on the plants rather than trying to raise them in a container or enclosure, since I wasn't that familiar with the species. Close-up of the same caterpillar. I would have like to have gotten more pictures of them as caterpillars. I didn't want to keep opening their nests up though, I figured it made them more vunerable to predators until they were able to close it back up again. Here is one of the nests they made, with a little more focus on the silk, so that you can see what they look like. Here is another picture of an adult with its wings open. Another one with wings closed. It is a closer up picture, but one of the eye spots is some what covered up. It is actually in the process of depositing an egg in this picture. 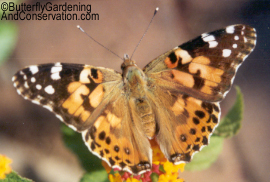 The following two pictures are to help you to be able to tell the difference between Painted Lady and American Lady butterflies. They look a lot alike. The easiest way to tell them apart is by looking at the number of eye spots on the outside of their wings. 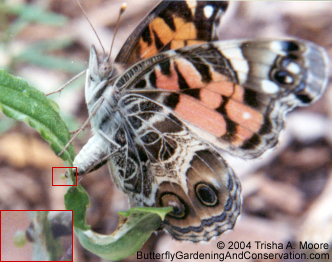 The American Lady has two, while the Painted Lady has 4-5 smaller ones (the 5th is sometimes hard to see). In reality it can be difficult to see these eye spots when they are fluttering around quickly from one flower to the other. But sometimes you get lucky and one stays still a second! 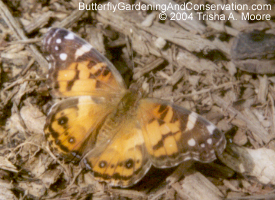 These two are an American Lady and Painted Lady with wings open. If you look closely you can see the differences between them. I find it easier to just check the eyespots when their wings are closed. Can you see the egg now?